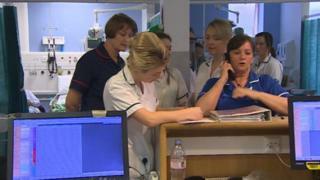 Wrexham Maelor Hospital has posted the worst waiting time for an accident and emergency unit in Wales on record. Latest figures for January show 49.3% of patients spent less than four hours in A&E. The target is 95%. This is worse than a previous low in August of 49.7%. Betsi Cadwaladr health board has blamed a "double whammy" of more elderly patients and staff shortages but said performance "wasn't what it should be". Overall, 77.2% of A&E patients in Wales were seen, treated, discharged, transferred and admitted within four hours in January, worse than the 77.8% for the previous month and for January 2018. Meanwhile, 5,292 patients waited more than 12 hours - the target is that no-one should spend that long in A&E. This is more than for the same month last year. Gary Doherty, Betsi's chief executive, said it had been "very busy and demanding" although there had been some progress, including an improvement in ambulance turnaround times. "I'm very sorry for the waits they've experienced," he said. "In some of our areas under the most pressure, about half of our patients are waiting more than four hours. That's not the service we want to give - it's not the service I'd want for myself - so we need to do better." He admitted steps needed to be taken in how emergency departments worked or how things were managed in the community. I've visited several A&E units, and it's not unusual for them to be really busy but this unit seemed more frenetic, chaotic even. The layout was complicated too. The facilities were, like the rest of the hospital, really showing their age. It is not a pleasant environment and that seemed to be adding to the sense of pressure. We know the health board has long-term plans to revamp or even rebuild Wrexham Maelor, that will cost millions and take years. But could just the prospect of a modern unit make the difference when it comes to attracting the consultants and middle-grade doctors that the hospital has recently been finding so hard to recruit? Wrexham Maelor had the worst A&E target time in NHS Wales history in August and, in December, barely half of patients were seen within the target time. It is hard to pin down a single cause. Over the last few years it has seen more patients over 85 who, in turn, have more complicated conditions, particularly in winter. It has a multi-disciplinary team working across nursing, therapy and social care to assess elderly patients with falls and respiratory illnesses in the emergency unit. The aim is to improve the flow through A&E and support them back into their homes. In January, 43 out of the 65 patients referred to them were given help by community teams back in their homes. "It can get really quite busy, it feels really upsetting at times to see patients on the corridors - which does happen unfortunately, throughout the week, not on certain days," said occupational therapist Vicky Warburton. "But at the heart of it is what the patient needs and care closer to home." Dr Ash Basu, consultant in emergency medicine, said they would be taking on an additional three trainee doctors from the summer, which would help with staffing issues. "I think we need to be a bit smarter about doing things, also ensuring staff are properly supported and trained," he added. "I think we're better now at addressing ambulance turn-around times. The flip-side of this, unfortunately, is we have patients sometimes in the corridor. This isn't ideal but we do try to release the ambulances as soon as possible." Dr Cameron Abbot, consultant geriatrician, believes they are getting frailer patients out of the emergency department quicker and on to wards or getting the right help, and added: "I think we're making a massive impact - and a big difference to patients." As part of a long-term plan for Betsi Cadwaladr, a refurbishment of the hospital could be examined. Over at Glan Clwyd, medical director Dr Emma Hosking said: "I'm not going to deny there aren't pressures but I think we've had some notable successes recently. "One of the things we've been able to do is dramatically reduce the time ambulances are outside our front door with patients in the back of them. That obviously makes the whole system better. "We've made some progress in reducing the amount of time patients stay in the emergency department before being discharged or seen." By the end of December, 86.9% of patients waiting to start hospital treatment had been waiting less than six months, lower than the target of 95%, while 2.9% had been waiting more than 36 weeks after being referred by their GP. Plaid Cymru health spokesman Helen Mary Jones AM said the level of poor performance did not happen in Scotland. "These figures are completely unacceptable and demonstrate a serious lack of competence on the Welsh Government's part," she said. "Winter happens every year - along with seasonal bugs and flus, and it can all be prepared and planned for." Conservative health spokeswoman Angela Burns AM said there was a "depressing circle of underperformance and mismanagement". "It is true that an ageing population and Welsh Government failure to fill staff shortages are having a huge negative impact on the ability of NHS Wales' A&E departments to meet demand," she added. "But these are not blips or inconveniences: they are the reality in which healthcare must be provided in Wales." Did your local services hit or miss their targets? If you can't see the tracker, click or tap here.